Working through past papers is a solid way to study for trials and finals. You can also switch between viewing end of year past exam papers and the supplementary exam papers. Subject 2010 2011 2012 2013 2014 2014 Exemplars 2015 2016 Accounting 2010 2011 2012 2013 2014 2014-exemp 2015 2016 Afrikaans Home Language 2010 2011 2012 2013 2014 2014-exemp 2015 2016 Afrikaans First Additional Language 2010 2011 2012 2013 2014 2014-exemp No Papers 2015 2016 Afrikaans Second Additional Language 2010 2011 2012 2013 2014 2014-exemp No Papers 2015 2016 Agricultural Management Practices 2010 2011 2012 2013 2014 2014-exemp No Papers 2015 2016 Agricultural Sciences 2010 2011 2012 2013 2014 2014-exemp 2015 2016 Agricultural Technology 2010 2011 2012 2013 2014 2014-exemp 2015 2016 Business Studies 2010 2011 2012 2013 2014 2014-exemp 2015 2016 Civil Technology 2010 2011 2012 2013 2014 2014-exemp 2015 2016 Computer Applications Technology 2010 2011 2012 2013 2014 2014-exemp 2015 2016 Consumer Studies 2010 2011 2012 2013 2014 2014-exemp 2015 2016 Dance Studies 2010 2011 2012 2013 2014 2014-exemp 2015 2016 Design 2010 2011 2012 2013 2014 2014-exemp 2015 2016 Dramatic Arts 2010 2011 2012 2013 2014 2014-exemp 2015 2016 Economics 2010 2011 2012 2013 2014 2014-exemp 2015 2016 Electrical Technology 2010 2011 2012 2013 2014 2014-exemp 2015 2016 Engineering Graphics and Design 2010 2011 2012 2013 2014 2014-exemp 2015 2016 English Home Language 2010 2011 2012 2013 2014 2014-exemp 2015 2016 English First Additional Language 2010 2011 2012 2013 2014 2014-exemp No Papers 2015 2016 English Second Additional Language 2010 2011 2012 2013 2014 2014-exemp No Papers 2015 No Papers 2016 Geography 2010 2011 2012 2013 2014 2014-exemp 2015 2016 History 2010 2011 2012 2013 2014 2014-exemp 2015 2016 Hospitality Studies 2010 2011 2012 2013 2014 2014-exemp 2015 2016 Information Technology 2010 2011 2012 2013 2014 2014-exemp 2015 2016 IsiNdebele Home Language 2010 2011 2012 2013 2014 2014-exemp 2015 2016 IsiNdebele First Additional Language 2010 2011 2012 2013 2014 2014-exemp No Papers 2015 No Papers 2016 IsiNdebele Second Additional Language 2010 2011 No Papers 2012 2013 2014 No Papers 2014-exemp No Papers 2015 No Papers 2016 No Papers IsiXhosa Home Language 2010 2011 2012 2013 2014 2014-exemp 2015 2016 IsiXhosa First Additional Language 2010 2011 2012 2013 2014 2014-exemp No Papers 2015 2016 IsiXhosa Second Additional Language 2010 2011 2012 2013 2014 2014-exemp No Papers 2015 No Papers 2016 No Papers IsiZulu Home Language 2010 2011 2012 2013 2014 2014-exemp 2015 2016 IsiZulu First Additional Langage 2010 2011 2012 2013 2014 2014-exemp No Papers 2015 2016 IsiZulu Second Additional Language 2010 2011 2012 2013 2014 2014-exemp No Papers 2015 No Papers 2016 No Papers Life Sciences 2010 2011 2012 2013 2014 2014-exemp 2015 2016 Mathematical Literacy 2010 2011 2012 2013 2014 2014-exemp 2015 2016 Mathematics 2010 2011 2012 2013 2014 2014-exemp 2015 2016 Mechanical Technology 2010 2011 2012 2013 2014 2014-exemp 2015 2016 Music 2010 2011 2012 2013 2014 2014-exemp 2015 2016 Physical Sciences 2010 2011 2012 2013 2014 2014-exemp 2015 2016 Religion Studies 2010 2011 2012 2013 2014 2014-exemp 2015 2016 Sepedi Home Language 2010 2011 2012 2013 2014 2014-exemp 2015 2016 Sepedi First Additional Language 2010 2011 2012 2013 2014 2014-exemp No Papers 2015 2016 Sepedi Second Additional Language 2010 2011 2012 2013 2014 2014-exemp No Papers 2015 No Papers 2016 No Papers Sesotho Home Language 2010 2011 2012 2013 2014 2014-exemp 2015 2016 Sesotho First Additional Language 2010 2011 2012 2013 2014 2014-exemp No Papers 2015 2016 Sesotho Second Additional Language 2010 2011 2012 2013 2014 2014-exemp No Papers 2015 No Papers 2016 No Papers Setswana Home Language 2010 2011 2012 2013 2014 2014-exemp 2015 2016 Setswana First Additional Language 2010 2011 2012 2013 2014 2014-exemp No Papers 2015 No Papers 2016 Setswana Second Additional Language 2010 2011 2012 2013 2014 No Papers 2014-exemp No Papers 2015 No Papers 2016 No Papers Siswati Home Language 2010 2011 2012 2013 2014 2014-exemp 2015 2016 Siswati First Additional Language 2010 2011 2012 2013 2014 2014-exemp No Papers 2015 2016 Siswati Second Additional Language 2010 2011 No Papers 2012 2013 2014 2014-exemp No Papers 2015 No Papers 2016 No Papers Tourism 2010 2011 2012 2013 2014 2014-exemp 2015 2016 Tshivenda Home Language 2010 2011 2012 2013 2014 2014-exemp 2015 2016 Tshivenda First Additional Language 2010 2011 2012 2013 2014 2014-exemp No Papers 2015 No Papers 2016 Tshivenda Second Additional Language 2010 2011 No Papers 2012 2013 2014 No Papers 2014-exemp No Papers 2015 No Papers 2016 No Papers Visual Arts 2010 2011 2012 2013 2014 2014-exemp 2015 2016 Xitsonga Home Language 2010 2011 2012 2013 2014 2014-exemp 2015 2016 Xitsonga First Additional Language 2010 2011 2012 2013 2014 2014-exemp No Papers 2015 No Papers 2016 Xitsonga Second Additional Language 2010 2011 No Papers 2012 2013 2014 No Papers 2014-exemp No Papers 2015 No Papers 2016 No Papers. Each download contains both the March and November grade 12 past exam papers and corresponding memoranda answer sheets for that year. Here is an excellent opportunity to get first hand experience of what to expect when you write your final examinations this year. Past Exam Papers kindly provided by the Department of Basic Education. You can now put the extra effort into those weak areas to better understand the subject. This way you will be better able to evaluate your weaknesses relating to that subject. Each of the non-language subjects has the corresponding Afrikaans exam papers with memoranda. We have managed to compile downloads for all of the subjects except the foreign languages. . After completing the paper check your results against the memorandum for that paper. VisitÂ EduOneÂ for more cool stuff to satisfy your educational needs. The matric subjects listed in the table below are sorted in alphabetical order. We know that exam time can be stressful, so for your convenience we have compiled a handy resource for you to download the grade 12 past exam papers to use as matric revision. Get connected to course options and opportunities that suit your interests in a few easy clicks. 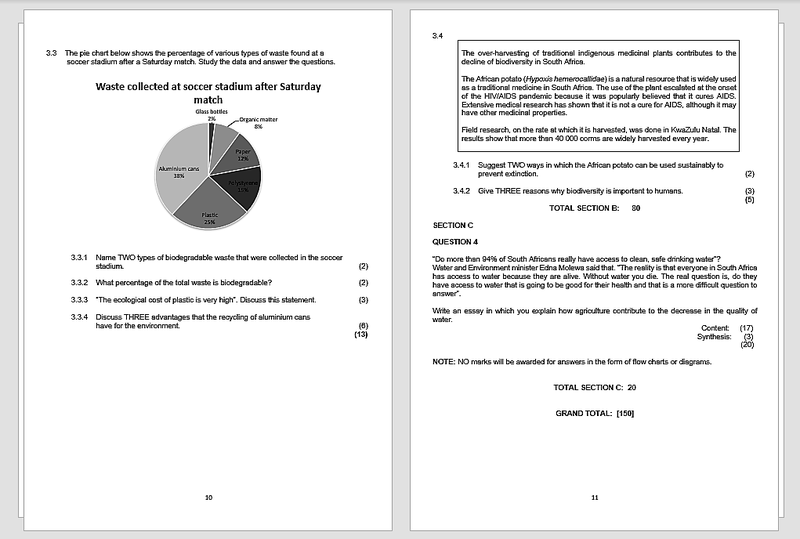 Grade 12 Past Exam Papers — Free Downloads! If you have any queries or just want to say hi, pop us a message Address: Suite 5, Sisco Building, 17 Shelley Road, Saltriver, Cape Town, 7925 1 a chat for you to message an education planner on our team, who will help you find info and answer questions. Â Time toÂ prep for the exams. EduConnect is a part of the EduOne network. For matrics, this is the closing ceremony of your high school career. Here we have collected all the Matric past papers we can find and have made them available to you for free. We advise that you download your grade 12 past exam papers for your subjects and go through them as if you were in a real time exam environment. You can find the official, government-set past papers from 2010 to 2017Â below. If we found a past papers information sheet, answer paper, past paper memo or marking guideline then we have also included them for you. . . .